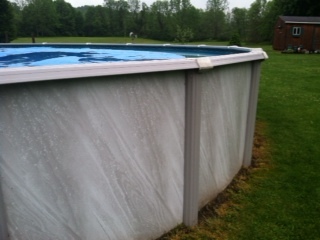 I have a 30ft Round Trevi Pool approx 12 years old and I have a few of the top rails rusting. 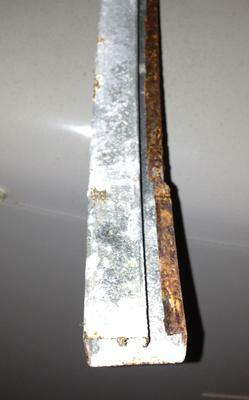 Is there replacement parts or kit to replace the top metal rails and plastic joiner pieces. I would like to replace with Plastic if available. did you find these parts? I'm looking for these as well. I too am looking for these. Anyone have an answer? Anybody help please ??? I have these old above ground pool, i guess is manufactory from Trevi and i'm having the worse time to find some top plates and some top caps . I can't find anywhere , please someone help me where to order ???? Also looking all over and saw this thread. Has anyone had any luck or found an alternative? 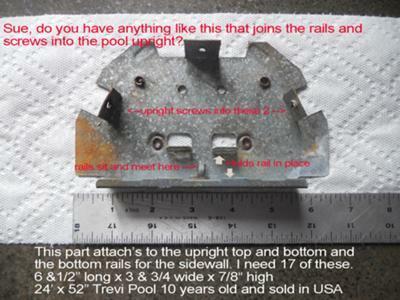 Where can I find replacement rails for a Trevi 10 year old pool. Sidewall sits into rail at base. Also the base clips, the bottom rails seat into this piece and the sidewall post screws into it. There are three names listed maybe that can help.. Looking for Bottom tracks for a Trevi above ground pool. They are based in Canada. I have a Trevi Lotus 15 round pool, three of the joiner plates are rusted, and I need to know where to get replacements. I checked all over the country trying to find Trevi pool replacement parts. I was able to find them through Pool and Spa Warehouse in Howard (Green Bay) WI. 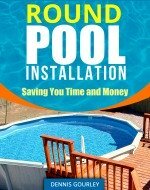 I have been trying to find replacement parts for my 3 year old 24'-0" diameter above ground "Trevi" pool. I have contacted "Trevi" through their website, but have gotten no response back from them. I am looking specifically for the resin seat cap that screws down onto the top of the upright columns and covers the intersections of the individual top rail peices. The cap has a part number on the back of it which is; “TRE-004-11-A”. It also has a smaller snap on cap to cover the screw attachment which has a part number printed on the back of it as well, which reads; “206-218”. I have tried to find a Trevi swimming pool supplier in the State of Wisconsin to purchase the caps from, since the company I bought my pool from is no longer in business, but have had no success in finding one. Any ideas where these caps can be ordered from, as I need to replace at least four of them? Trevi Fabrication 1888 777 0447. Hope you speak French. Hi, I am looking for an inner stabilizer for a Trevi pool. The measurements of it are 53" long and 1.25" across. The profile of it is attached. I contacted them but they are not very informative on the part, just telling me parts are not universal. I am need of some replacement top seat covers for my Trevi above ground 28' round pool. Any suggestions? www.intheswim.com 1-800-288-7946 I just call them about this. They are going to call the manufacturer (which is in Canada) and call me back. 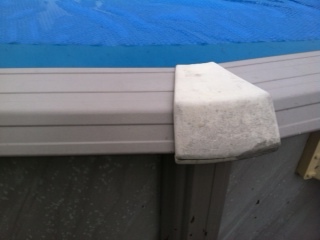 Hi, I was givin a 2005 24' Trevi above ground pool with no model info. 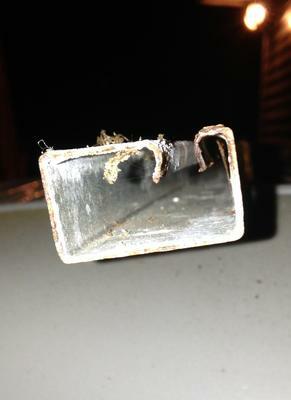 I removed the pool and started cleaning up parts and realized that some of the bottom rails are rusted through. I'm having trouble finding these online. Any help would be appreciated. Need to find replacement top caps for my above ground Trevi pool. Have looked on many sites with no luck. I am looking for the bottom tracks, also looking for 1 bottom post plate and 6 top caps.